Channel 13 WHAM featured the AC Aces robotics team on their Bright Spot on January 23rd. The Aces placed second in the Excelsior District Finals, earned the Finalist Team Alliance Trophy, and was a finalist for the Promote Video Award. Check out AC’s recent media coverage below! Please note that the clips below will display best on desktop or laptop computers as opposed to mobile devices. AC’s Robotics Team, the Chrononauts, competed in the Finger Lakes FIRST Tech Challenge Tournament at St. John Fisher College. The team placed 15th overall and was awarded the Rockwell Collins Innovate Award, advancing them to the Excelsior NY Regional Championship in February. The Rockwell Collins Innovate Award is given to one team per tournament that thinks outside the box and has the most innovative and creative robot design. Click here to see the full article! This article is a reprint of the feature story that appeared in 585 Magazine and highlights Laura Reynolds-Gorsuch, AC’s Food Service Director. In the article, Laura shares her recipe for AC Pumpkin Chocolate Chip Cookies, a favorite among AC faculty, staff, and students. Click here to see! This High School Athlete of the Week article and video feature AC junior Adelaide “Addy” Flood. She states that, “This year as a captain, I hope to encourage my team like the seniors last year and the year before encouraged me.” Click here to see! Several news outlets featured AC tenth grader John Phillips as he performed in the Macy’s Thanksgiving Day Parade. Click the following links to see the coverage from 13WHAM, Time Warner Cable News, and CNYCentral.com. AC students Phelan Conheady and Catherine Kennedy, and ASL Interpreter Steph Regan, appeared on Good Day Rochester to talk about AC’s production of “Cinderella” and the use of sign language during the show. Click here to see the interview! This Brighton-Pittsford Post article highlights AC’s Book Event Series. Throughout the year, AC will host events so that members of the community can discuss the best-selling book about transforming education, Most Likely to Succeed: Preparing Our Kids for the Innovation Era, by Tony Wagner and Ted Dintersmith. Click here to learn more! This Rochester Business Journal article announces three individuals who joined the AC team this year: Margarita Chaves as a World Language Teacher, John Curatalo as a Physical Education Teacher, and Angie Burch as an Accounting Specialist. Click here to see! The Brighton-Pittsford Post highlighted AC’s recent author visit by publishing a photo of AC ninth grader Roxana “Roxy” Reisch introducing Greece author Charles Benoit before he presented a talk called “Stuck in High School: Why I Write Young Adult Fiction (and Why You Should Read It)”. Click here to see! The Brighton-Pittsford Post highlighted AC’s fall open house, at which attendees had the opportunity to meet teachers, students, and administrators and tour the campus. Click here to see! This television news story highlights AC tenth grader John Phillips as he prepared to perform in the Macy’s Thanksgiving Day Parade. As part of this experience, his trumpet skills were seen by an estimated 53 million people. Click here to see the story! AC’s Summer LEAP Program is mentioned at the 10:43 mark of this television show, which discusses the ongoing effort to improve outcomes for Rochester-area children. Click here to see! We’re doing so many exciting and interesting things here at AC and look forward to sharing more media coverage with you in the future! as opposed to mobile devices. 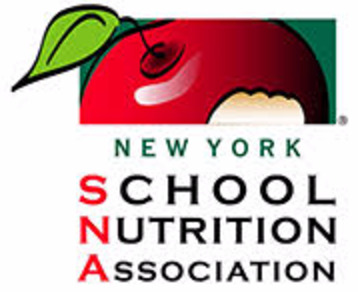 Laura Reynolds-Gorsuch, AC’s Food Service Director, is featured in this article highlighting local school lunch programs. In the article, Laura shares one of her favorite recipes: AC Pumpkin Chocolate Chip Cookies. Click here to see! In this article, the Brighton-Pittsford Post shares details about three of AC’s most recent hires: Angie Burch, Accounting Specialist; Margarita Chaves, Lower School World Language Teacher; and John Curatalo, Physical Education Teacher. Click here to read about these three, and stay tuned for announcements about other faculty and staff members who joined AC this year! The Fairport-East Rochester Post recently announced the appointment of Margarita Chaves as Lower School World Language Teacher. Click here to see, and check back for announcements about other faculty and staff appointments! AC faculty member Beth Guzzetta has been featured as Educator of the Week on the National Geographic Education Blog. The interview highlights Beth’s work as a Middle School math and science teacher and an international research educator who organizes programs that emphasize field research as well as respect for other cultures and environments. Click here to see! John Phillips, a 10th grader at AC, will be playing in the Macy’s Thanksgiving Parade this November. John is the first musician from Monroe County to play in the Great American High School Marching Band as part of the parade, and just four high school students were selected from New York to march in the parade as part of the band, which has been marching for the last ten years. Click the following links to see 13WHAM’s online video coverage, 5 a.m. show coverage (clip begins at the 6:26 mark), and online story. You can also click the following links to see FOX Rochester’s online video coverage,morning show coverage (at the 15:14 mark), and online story. Finally, visit this link to see WROC’s television coverage (at the 45:23 mark). AC alum Stacey Romeo ’87 is featured in this Democrat and Chronicle article. As highlighted by the article, she was part of a mock trial team that won a national championship in San Francisco while she was a senior at Allendale Columbia School in 1987. After receiving an undergraduate and master’s degree, she decided to pursue a career in law. Click here to see the story online! Mick Gee, Head of School, and Kristin Merriman, College Advisor, recently appeared on Good Day Rochester to share tips for students as they apply to college. They suggest that it’s important for students to own the process and start early. Click here to see! This Rochester Business Journal Fast Start article features Courtney Dixon, AC’s Director of Marketing and Communications. In addition to her efforts to tell AC’s story to both internal and external audiences, Courtney also worked with AC’s advancement and development personnel to launch the highly successful Make Your Mark Gala, and serves as an adjunct professor at Roberts Wesleyan College. Please click here to see! Shannon Baudo, AC’s Director of Enrollment Management and Financial Aid, is highlighted in this Rochester Business Journal article discussing enrollment trends at some local schools. In the article, Shannon shares that AC opened 2016-2017 with its highest enrollment in several years. Click here to read more! This Rochester Business Journal article highlights Mick Gee, Head of School. As stated in the article, since 2012 enrollment is up 26 percent, the annual fund has more than doubled, and the campus has expanded with the opening of a $250,000 Design & Innovation Lab. Please click here to read the full article! 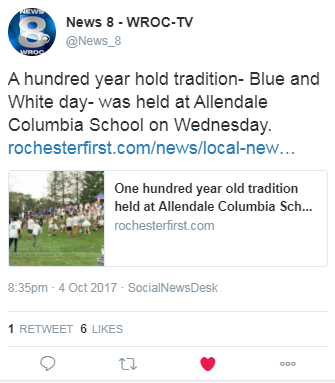 Allendale Columbia School has recently been featured in a number of news outlets, providing an opportunity to showcase our position as a cure for the Common Core in front of a wide range of audiences! Highlights are included below; we hope you enjoy reading about some of the great things happening at AC! Please note that the clips below will display best on desktop or laptop computers as opposed to mobile devices. News reporter Jennifer Johnson spent a morning at Allendale Columbia School covering our food program and interviewing Laura Reynolds-Gorsuch, Food Service Director; Dr. Elizabeth Murray, AC parent and pediatrician; Lindsey Brown, AC faculty member and Director of AC’s Summer LEAP Program; and students Indiia Maring and Juliana Bruno. Click here to see! More than 450 people joined honorary chairs the Judson family and co-chairs Duffy Palmer and Mark Siwiec at Oak Hill Country Club for AC’s Make Your Mark Gala. The event celebrated AC’s rich 125- year history and raised $265,000 for the school. Click here to see! 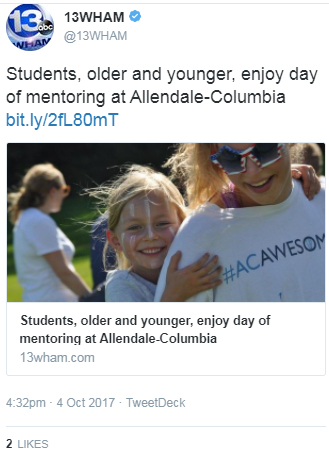 Allendale Columbia School’s Summer LEAP program was featured in this Fairport-East Rochester Post article. LEAP works to combat summer learning loss as students participate in a variety of academic experiences and field trips. The article includes a photo of students involved in a S.T.E.M. experiment in AC’s Design & Innovation Lab, which opened last fall. Click here to see the story online and here to see the story in print! This full-page feature includes photos from Allendale Columbia School’s Make Your Mark Gala, stating that the very well attended event provided a chance to celebrate the school’s 125-year history and reflect on the accomplishments of current and former students. Click here to see! This news story featured a partnership between AC, The Earthworks Institute, Senator Funke, Senator Robach, Assembly Majority Leader Morelle, Summer LEAP, and The Center for Youth. Funded by a state grant Earthworks received and hosted at AC, students from The Center for Youth and Summer LEAP have been given the opportunity to participate in a week-long outdoor camp experience called Runnin’ Wild. Please click here to see! Thanks to a $25,000 New York State grant, a local non-profit known as Earthworks is able to give up to ten children a five-day summer camp experience. The organization works in partnership with AC’s Summer LEAP program to help Rochester City School District students who want to attend the Center for Youth’s camp. Click here to see! Channel 13 did a Bright Spot featuring AC’s Summer LEAP program. This initiative fights summer learning loss by providing free summer programming as students from Rochester City School No. 17 attend classes for six weeks, receive meals and work on reading, math, health, character development, art and music. Click here to see! This Rochester in Focus feature that appeared on Channel 10 highlights AC’s Madagascar trip and includes interviews with AC faculty member Beth Guzzetta and student Adelaide Flood. Please click here to see the coverage, which has been uploaded to Vimeo!